Despite the mild weather we had this winter in New England, all of us at Darby Road are so excited for Spring and nice weather! Spring is the best time to clean out your home, refresh your decor and get ready for the summer! Here are some of our tips on how to rejuvenate your home to reflect the growth and change a new season brings. Throw Pillows! Swap out those old, dark throw pillows and refresh with some new brighter ones! Or patterned, if you’re feeling particularly wild! This is a great way to refresh an entire room, without breaking the budget. New Bedding! Another easy, budget-friendly tip. Swap out your heavy winter duvet, for a light and airy spring one! Try a lighter color, some floral patterns, or a lighter linen. 3. Artwork This is one of my favorite things to change out- It’s a bit more of an expensive option, but it makes a massive difference. Spring is all about bright colors and freshness, so adding new artwork, or swapping out the artwork you do already have- is a great way to dress up your space and make a big impact. 4. Renovation Time! Have room in your budget for a renovation? Now is the perfect time to do it! Whether you choose to go the D.I.Y route, or the professional route, this is the best time to re-imagine your space. This way, it’s done for all the fabulous summer parties you’ll throw! 5. De-clutter, Organize & Purge! It’s time to get rid of all that old junk you’ve been hanging onto and make room for new things! Whether it’s your closet, your pantry, your living room, or your basement; Take a day and go through each space, deciding what pieces to keep and what pieces to donate. 6. Flowers & Plants Bring spring into your home through fresh flowers and plants. If you’re not the best plant-parent or maybe you have allergies, try some succulents, they’re fairly easy to care for and are a great addition to liven up a space! I love bringing in air-purifying plants into my space this time of year. Now you’re ready for the warm months! If you try out any of these tips, let us know on Instagram @darbyroadhome! We’d love to see what you do. Darby Road HOME loves to feature local designers and artists, and this month we are highlighting a piece by Design Walker Studios! Cindy Walker Cox specializes in refurbishing vintage and antique furniture, adding a modern flair to inherent vintage beauty. Cindy’s process begins with allowing the piece to speak to her in order to determine the paint, stain and fabric selection that will best suit her client. Each piece is stripped to the bare wood and repaired as necessary. The majority of chairs are built with webbing and spring coils using the 8-way hand tied method (stay tuned for our next blog post which will be all about spring systems!). The piece is then painted and protected with varnish, polyurethane, or wax dependent upon the type of paint. Once the finish has cured, Cindy reupholsters the chair using high quality foam, cotton, and designer fabrics. We spoke with Cindy about this piece and she gave us some great background information about it. This frame is circa 1970’s and is a replica of Louis XV style chair. Coordinating fabrics and paint colors are the most exciting part of refurbishing my pieces. I love to transform vintage pieces using modern finishes and fabrics with complimenting colors, textures and patterns. I pull fabrics to enhance the personality of each piece. 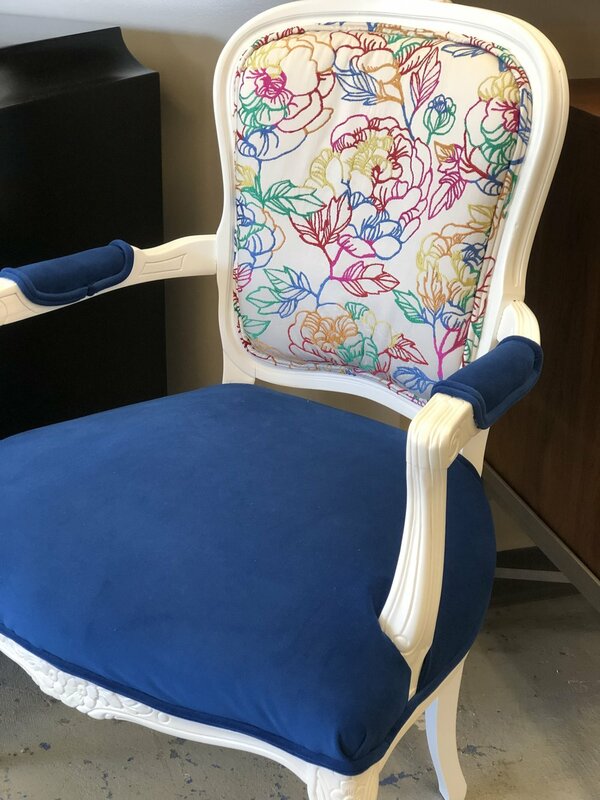 On this piece, the embroidery fabric on the inside and outside seat back is a dazzling embroidery with copper, gold, cobalt blue, kelly green, red and magenta. In selecting the fabric for the seat, I found a stunning solid blue velvet. Velvets hold such intense colors and are luxurious enough to enhance the colorful embroidery. The frame was painted with a white latex paint, protected with several coats of polyurethane.